Metastatic brain tumor, also known as secondary cancer, is the most common brain tumor in adults and is estimated to affect between 200,000 and 300,000 people per year. Metastatic brain tumor, also known as secondary cancer, is the most common brain tumor in adults and is estimated to affect between 200,000 and 300,000 people per year, according to The American Brain Tumor Association. The growth in the metastatic cancers market is owing to improved diagnostics, increasing incidences of metastatic cancers, advances in research and technology, emerging therapeutics and treatment options and improved awareness. While the high costs of treatment and chemotherapy are acting as a barrier to realizing the full growth potential. 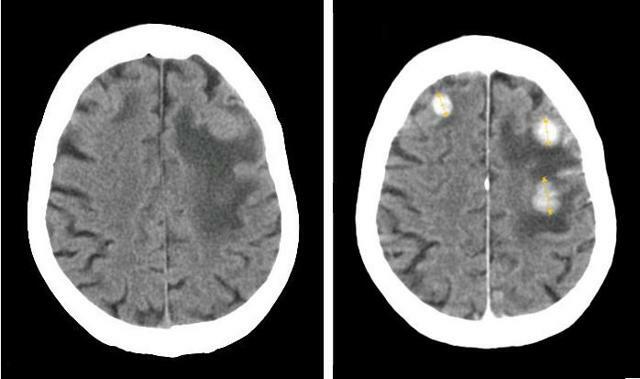 The current treatment practices for metastatic brain tumor include Surgery, Radiation, Radiosurgery, Brachy Therapy, Radio Enhancers, Chemotherapy but these come with moderate to severe side – effects such as peripheral tissue/cell damage, ineffective dosage due to the blood brain barrier, etc. According to a report titled “Brain Tumor Diagnosis And Therapeutics Market To Be Driven By Rising Requirement of Treatment For Symptoms Related To Brain Metastasis Till 2025” by Million Insights, the Brain Tumor Diagnosis And Therapeutics Market is projected to reach USD 773.1 million by 2025 growing at a CAGR of 8.1%. We take a look at companies that are seeking to overcome the limitations offered by existing therapy and improving patient’s life expectancy and quality of life. 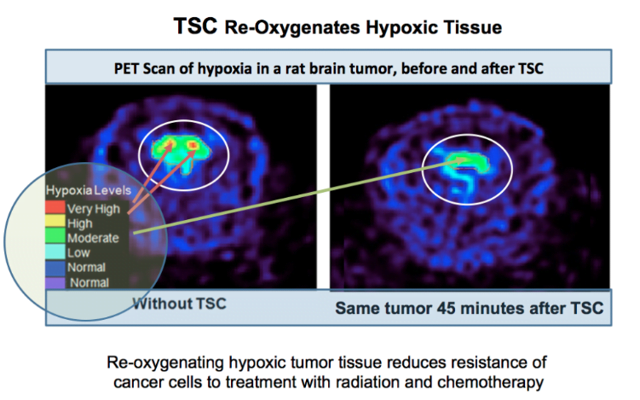 Diffusion is developing its lead drug candidate trans-sodium crocetinate to fight inoperable GBM brain cancer that can restore supply of oxygen to hypoxic tumor tissues, thereby enhancing the effectiveness of radiation and chemotherapy. The company is seeking to address the unmet needs in the brain metastases segment where currently there is no approved chemotherapy treatment. With an estimated 98,000 to 170,000 new cases diagnosed in the United States each year, TSC plans to capitalize on its safety history to launch Phase II clinical trials for this indication after having been granted an Orphan Designation for the use of TSC in brain metastases in 2012. In addition, the company is also targeting treatment-resistant cancer tumours, Glioblastoma Multiforme and pancreatic cancers. The company seeks to utilize the favorable FDA guidelines for these conditions to leverage its orphan drug status and approval processes. Besides its application in oncology, the company seeks to use TSC for fulfilling gaps in other areas such as stroke, cardiovascular emergencies, ambulatory services and neurodegenerative diseases. The company has an impressive portfolio of intellectual property rights with 14 U.S patents and 46 non-U.S patents related to composition of matter and the use of TSC for the treatment of cancer in conjunction with chemotherapy and radiation that offer it protection till 2025, plus an expected extension till 2031. The candidate has also received an orphan drug status from the FDA giving it 7-year exclusivity. The company is collaborating with UCLA and University of Virginia for its trails of ambulatory administration of TSC for stroke treatment. The company also appointed a new Chief Financial Officer, Mr. William “Bill” Hornung, previously the company’s Chief Business Officer, a consummate administrator with over 20 years of experience with companies originating out of University Research communities. As per its Q3 financial results, the company declared assets worth $23.6 million including cash and cash equivalents of $11.0 million. Nektar’s focus areas are cancer, auto-immune disease and chronic pain, where the company seeks to make an impact with its novel Polymer chemistry platform. 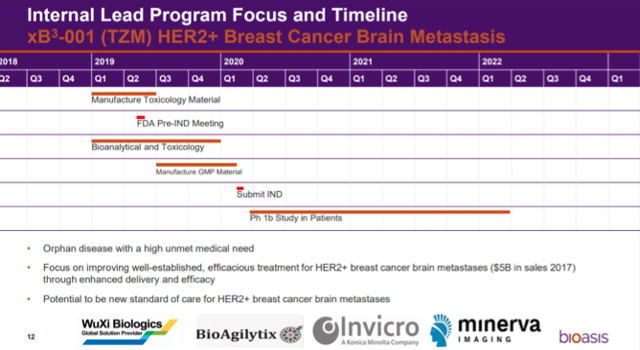 The company’s lead drug candidate is ONZEALD™ (etirinotecan pegol), for women diagnosed with Brain metastases in advanced stages of breast cancer. The existing TOPO I-Inhibitors used for treatment have severe limitations such as narrow therapeutic index, damaging healthy peripheral tissues and rapid metabolism that reduces their efficacy. Nektar’s ONZEALD (etirinotecan pegol) is a first-in-class long-acting topoisomerase I-inhibitor (Topo I), that has shown to overcome the limitations of existing medication with an improved safety profile. Nektar is the go-to company for clinical collaborations, co-development and licensing agreements with top-notch Biotechnology and pharmaceutical companies such as Astra Zeneca, Bristol-Myers Squibb, Amgen, Shire, Halozyme, Roche, Pfizer, Lilly and Taekda to name a few, that use the company’s platform technologies to develop next-generation therapeutics. 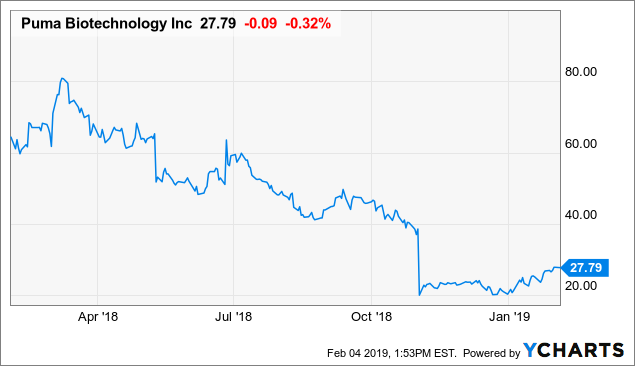 In addition, the company has a pipeline of over 10 new drug candidates such as NKTR-181 for chronic low back pain, NKTR-214 in combination with OPDIVO (nivolumab) for Melanoma, Renal Cell Carcinoma, Immuno-Oncology and Urothelial Cancer (in partnership with Bristol- Myers Squibb), PEGPH20 for pancreatic cancer (in partnership with Halozyme), Dapirolizumab Pegol (Anti-CD40L) for systemic lupus erythematosus (SLE) (in partnership with Biogen), NKTR-214 in combination with TECENTRIQ (atezolizumab) or KEYTRUDA (pembrolizumab), NKTR-358 for Auto Immune disease (in partnership with Lilly), NKTR-262 in combination with NKTR-214, NKTR 214 in combination with TAK-659 (in collaboration with Takeda) and NKTR-255 for immune-oncology. 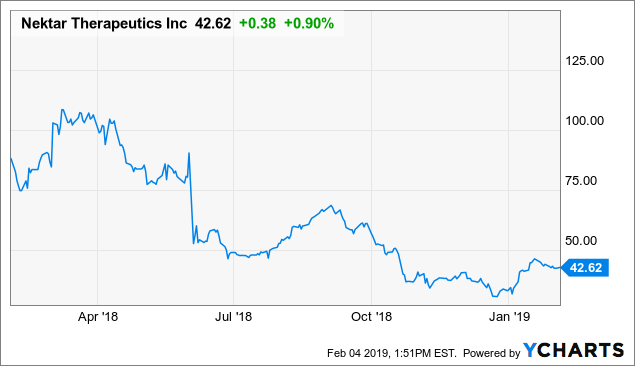 The company also has licensing agreement with Astra Zeneca for Movantik in lieu of which it will receive escalating royalties on sales and milestone payments. It also has collaboration with Baxalta, a subsidiary of Shire plc, for development of ADYNOVATE™ for treatment of Hemophilia A in exchange for royalties and milestone payments. As per its Q3 financial results, the Company reported cash and investments balance of $2.0 billion as on September 30, 2018 as compared to $353.2 million as on December 31, 2017. The company’s proprietary Bioasis xB3 platform, based on a human transport protein, is designed to bypass the blood-brain barrier thereby allowing therapeutics to be delivered to the brain in precise doses for tackling neurological diseases. This novel protein uses a process called receptor-mediated transcytosis to carry molecules across the blood-brain barrier to its target area within the brain. The platform can be used to carry any molecule irrespective of size and type such as monoclonal antibodies, enzymes, small molecules, small-interfering RNA (siRNA) and gene therapy. Image Source: Alliances | Bioasis Technologies, Inc. The company seeks to use this platform for offering therapeutic solutions in central nervous system diseases and disorders, including brain cancers, metabolic and neurodegenerative diseases. 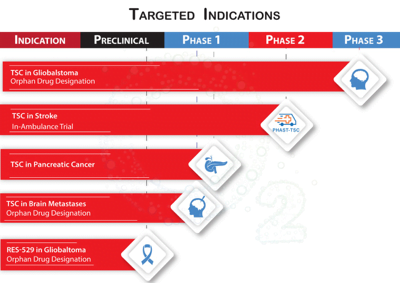 Bioasis currently has various programs under different stages of development such as xB3-001 for treatment of Brain Metastases, xB3-002 for Glioblastoma, xB3-007 for Neurodegenerative Diseases such as amyotrophic lateral sclerosis, Parkinson’s, Alzheimer’s and Huntington’s. 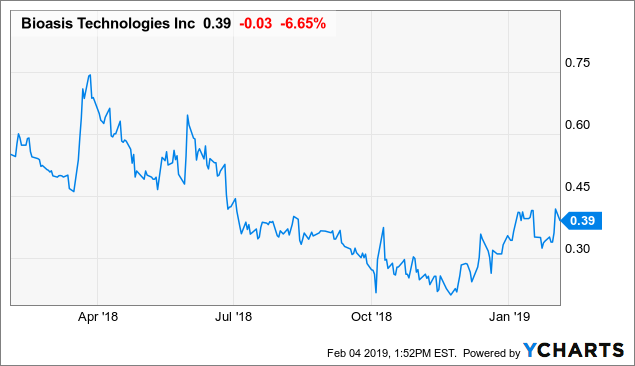 The company has entered into a licensing agreement with Prothena Corporation plc for using the xB3 platform with an undisclosed neurodegenerative disease target, plus an option for three additional neuroscience targets in return Bioasis received US$1 million upfront payment along with milestone payments and royalties on net sales. It has also entered into joint research collaboration with a leading pharmaceutical company (name undisclosed) for manufacturing an antibody-peptide conjugate containing Bioasis’ xB3 peptide for in vivo measurement in the CNS; under the material transfer agreement the company will receive $500,000. 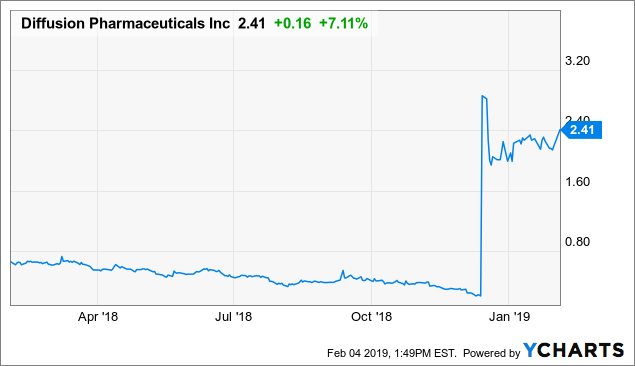 The company specializes in acquiring licenses for novel therapeutics with a focus on oncology that have completed initial clinical testing and develops them for commercial use. Its lead drug candidate PB272 (neratinib) is a potent irreversible tyrosine kinase inhibitor, or TKI that can obstruct signal transduction through the epidermal growth factor receptors, or EGFRs, HER1, HER2 and HER4. The initial focus of the company is on developing PB272 (neratinib) as an oral treatment for patients with HER2-positive breast cancer, that has a very high incidence of brain metastases. The drug has received FDA approval for NERLYNX® (neratinib) for the treatment of early stage HER2-positive breast cancer following adjuvant trastuzumab-based therapy. The drug has received an approval for sale in the E.U. It has also received approvals from the regulatory authorities in China and Canada. The drug will be launched in the European and Germany market in 2019. It has a licensing agreement with CANbridge Pharmaceutical Inc. in China for NERLYNX® (neratinib). 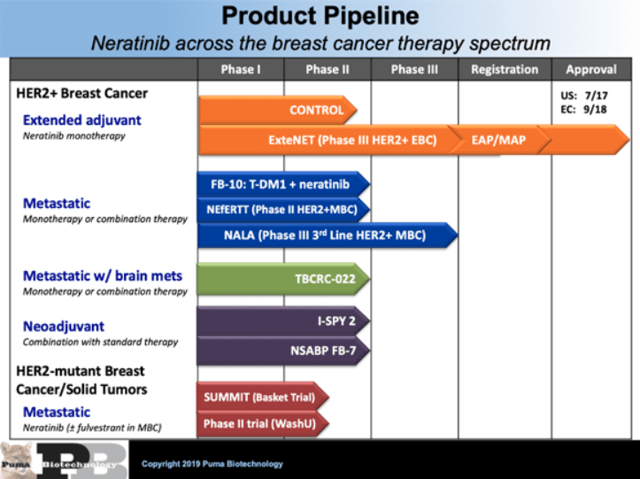 As per the company’s statement CANbridge Pharmaceutical Inc received confirmation that China’s National Medical Products Administration (NMPA) has accepted its New Drug Application (NDA) for NERLYNX® (neratinib) for the extended adjuvant treatment of adult patients with early stage HER2-positive breast cancer, following adjuvant trastuzumab based-therapy. In Canada, it has signed an exclusive licensing agreement with Knight Therapeutics Inc for NERLYNX® (neratinib). Puma will receive upfront and milestone payments up to $7.2 million as well royalties on sales in Canada. As on September 30, 2018, Puma had cash and cash equivalents of $68.3 million and marketable securities of $59.7 million, compared to cash and cash equivalents of $81.7 million at December 31, 2017 as per its Q3 financial results. 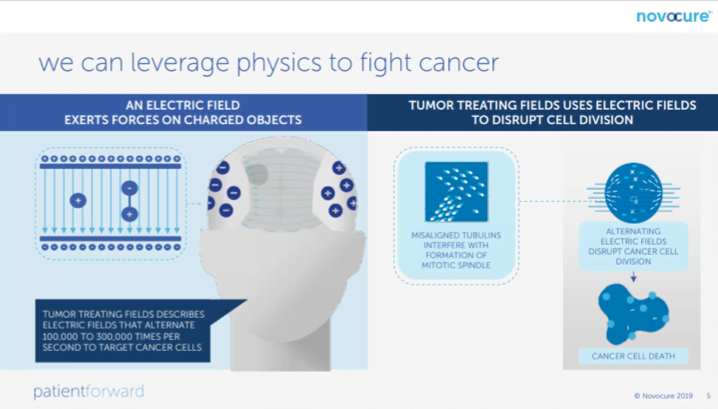 Optune®, the Tumor Treating Fields delivery system for glioblastoma (GBM), is the company’s innovative treatment for cancer involving use of alternating electric fields applied at specific frequencies to disrupt cancer cell division and cause cell death. The company currently markets this product in U.S, Germany, Austria, Switzerland, Israel and Japan. The technology uses physics to disrupt cancer cell division by working on the highly polar cellular proteins such as tubulin and septin by subjecting them to pressure from alternating electric fields; it does not damage healthy tissue or cells. 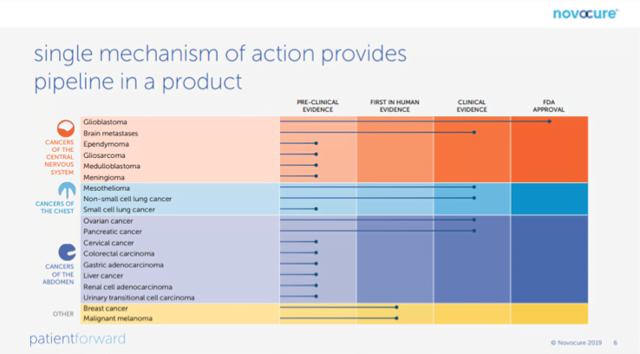 The company seeks to extend the delivery system for treating other forms of cancer such as brain metastases, non-small cell lung cancer (NSCLC), pancreatic cancer, ovarian cancer, liver cancer and mesothelioma and is currently engaged in clinical trials. 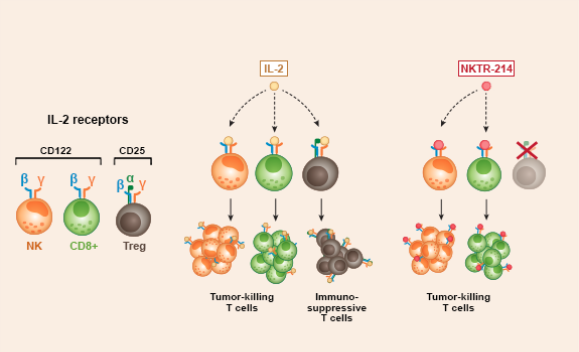 Preclinical studies have shown a consistent anti-mitotic effect in 18 different solid tumor types in culture and in eight in vivo tumor models. METIS is the name of the company’s drug program directed towards Brain Metastates from non-small cell lung cancer (Phase 3 Pivotal). In the pipeline are LUNAR (Non-Small cell lung cancer), PANOVA 3 (Pancreatic cancer) and STELLAR (Mesothelioma). The company has over 140 patents issued globally with expiration dates in and around 2036, with more patents pending worldwide. 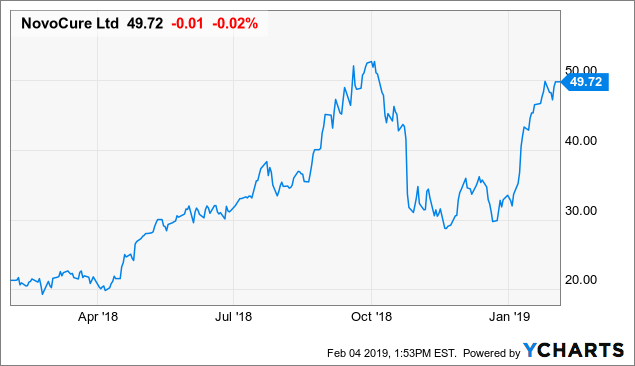 The company reported preliminary net revenues of $248.0 million in 2018, representing annual growth of more than 40 percent compared to 2017 as per its Q3 Financial results. Cash and cash equivalents were at $140.6 million as compared to $78.6 million during the same quarter in 2017. - Can These Breakthrough Therapeutics win the fight against Mesothelioma?